Legendary CEO Charles Koch shows managers, entrepreneurs, leaders, students, innovators, and employees of all kinds — and in any field — how to apply the principles of his revolutionary Market-Based Management® system to generate good profit in their organizations, companies, and lives. In 1961, Charles Koch joined his father’s Wichita-based company, then valued at $21 million. Six years later, following his father’s death, he was named chairman of the board and CEO of the company. Today, Koch Industries’ estimated worth is $100 billion — making it one of the largest private companies in the world. Koch exceeds the S&P 500’s five-decade growth by 27-fold, and plans to double its value on average every six years. What exactly does this company do and why is it so remarkably profitable? Koch’s name may not be on your stain-resistant carpet, stretch denim jeans, the connectors in your smart phone, or your baby’s ultra-absorbent diapers, but it makes all of them. And Charles Koch’s Market-Based Management® system is what drives innovations like these – and many more. Based on five decades of interdisciplinary studies, experimental discovery, and practical implementation across Koch businesses worldwide, the core objective of MBM is as simple as it is effective: to generate good profit. Good profit results from products and services that customers vote for freely with their dollars; products that help improve people’s lives. It results from a culture where employees are empowered to act entrepreneurially to discover customers’ preferences and the best ways to satisfy them. Good profit is the earnings that follow when long-term value is created for everyone — customers, employees, shareholders, and society. Create an environment of knowledge sharing similar to a community of scientists — rejecting bureaucracy and hierarchy in favor of a culture that prizes (and even demands) respectful challenges from everyone in the company, at every level. Motivate all employees to maximize their contributions by effectively structuring incentives so employees’ compensation is limited only by the value they create — not budgets or company-wide policy. Charles Koch is chairman of the board and CEO of Koch Industries, Inc., a position he has held since 1967. He is renowned for growing Koch Industries from just $21 million in the early 1960s to its current estimated value of $100 billion. Mr. Koch has supported academic and public policy research (including many Nobel Prize winners) for more than 50 years, and helped build a number of organizations focused on research, policy, and education to advance the understanding of the free society, including the Cato Institute, the Institute for Humane Studies, and the Mercatus Center. He supports numerous nonprofits through the Charles Koch Foundation and the Charles Koch Institute, including an organization called Youth Entrepreneurs, which teaches at-risk high school students the values and skills they need to succeed in life. The Charles Koch Foundation provides funding for more than 400 research and education programs at about 250 colleges and universities. Mr. Koch holds a bachelor’s degree in general engineering as well as two master’s degrees in nuclear and chemical engineering from MIT. He and his wife Liz have been married 43 years. They have two children and two grandchildren. His new book, “Good Profit: How Creating Value for Others Built One of the World’s Most Successful Companies”, goes further, blending biographical tidbits and company history with case studies on how he’s applied his principles to Koch Industries. Along the way, he quotes everyone from the Buddha and his father and company founder, Fred Koch, to psychologist Abraham Maslow and free-market economists, such as Friedrich Hayek. Charles Koch’s “Good Profit: How Creating Profit for Others Built One of the World’s Most Successful Companies” defends the free and prosperous commonwealth against cronyism (aka ‘bad profit’). But more than that, the author presents insights about economic freedom to set up his business management ideal, Principled Entrepreneurship. Although “Good Profit” is primarily a guide for business owners and entrepreneurs, his book does offer advice for investors. Koch warns against overconfidence in making predictions, relying too much on experts and counting “sunk costs” based on past decisions (thinking “I’ll stay with this bad investment until it turns around and I get my money back”). According to Koch, investors should beware of “confusing random events with patterns that are really unpredictable.” Technical or charting analysis can lead you astray when they go contrary to sound fundamentals about a company. The process of creative destruction can be competitive and sometimes messy and imperfect. But the real story of “Good Profit” is how a great American family is striving to do well by doing good. The book—a blend of biography, social theory and management advice—also sheds light on the system of beliefs that guide Mr. Koch, both in business and in politics. His overarching view is that society benefits when people are free to pursue work they love, making them more productive. In “Good Profit,” Mr. Koch holds up his company as the living example of those ideals, from its emphasis on an employee’s values over his résumé to a relentless drive to question everything Koch Industries does and to strive for new ways to be more efficient. He cites the company’s growth—it has added 85,000 employees since just 2004—as evidence that these methods work. Charles Koch’s new book, Good Profit, is written for two different kinds of readers. The first is the entrepreneur who wants to build up a firm, as Koch did in spectacular fashion. So much so that an investment of $1,000 in the company back in 1960 would be worth $5 million today (if dividends had been reinvested in the firm). I’m not that kind of reader, alas. I’m the second kind, who wants to know how a company that foreswears crony capitalism can thrive, as Koch Industries did. Charles Koch’s new book, “Good Profit, How Creating Value for Others Built One of the World’s Most Successful Companies,” is a must-read for anyone seeking to understand the management philosophy of one of America’s great business leaders. The story of Koch Industries’ success, recounted in detail in this book, is so enormous and astonishing that at first glance, the reader might mistake it for a work of fiction. Charles Koch has written an excellent book, Good Profit, exploring how and why Koch Industries has been so successful. In the book… he defines “good profit” as that from which a business makes from products and services that consumers freely choose to buy. Simple? Yes, but it’s surprising how many companies forget that truth. His Market-Based Management system draws on those same insights at the level of the individual organization, and an exposition forms the meat of the book. In essence, it is a framework for encouraging effort and creativity by devolving authority and rewarding entrepreneurship and ‘prudent’ risk-taking. 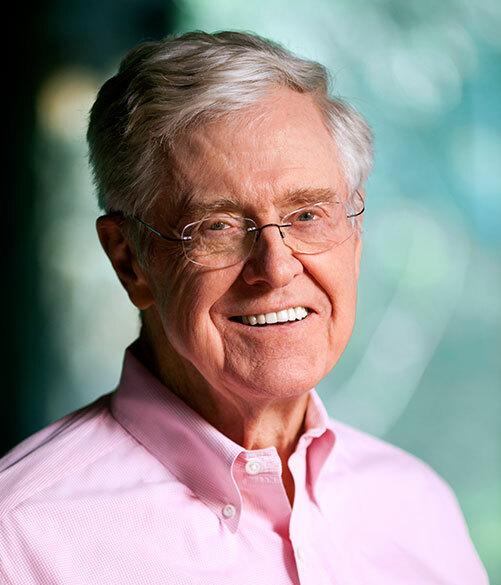 In his new book … Charles Koch details the business practices and management framework he used to turn the name Koch into one that means so many things: wealth, business success, politics and untold influence. It was page 243 that really summed it up for me – the point that brings it all together. Of course, what am I talking about? I recently read a book that anyone in business, nonprofits or any type of organization for that matter should consider reading. While the book takes experiences from one of the largest and most successful companies in the world, the principles behind that business can be used anywhere. This book is Charles Koch’s attempt at explaining the principles that he used to take his father’s company from a 1961 valuation of $21 million to one worth $100 billion in 2014. Put another way: Someone who invests $1,000 in Koch Industries in 1960 would now be holding $5 million in wealth. That’s a return 27 times greater than the average investor would have turned on the S&P 500 index. I believe Charles Koch’s integrity and professional leadership are representative of the founding principles of America. This book is an excellent tool for entrepreneurs focused on achieving great things in a principled manner. Chairperson, Hendricks Holding Co., INC. Writing about Charles Koch has become a cottage industry but, until now, there’s been little from the man himself. Read his new book, Good Profit, and you can learn directly from him what he thinks and how he has built one of the biggest and most successful businesses in the world. The ultimate “how to” book on running a successful business. Charles Koch’s approach is extraordinarily thoughtful and comprehensive, reflecting his more than 50 years of experience in growing Koch Industries to the second largest private corporation in America. His emphasis on the key role that values play in his leadership and management model is especially important in today’s business environment. A must read for those who want to take their enterprise to the next level. Here is a clear example of the American dream and how our country benefits when successful entrepreneurs create new jobs while providing the golden egg for philanthropic efforts. The real story behind this book is not just Charles Koch’s secret to success – it is the remarkable path he and his brother took in becoming two of America’s most generous philanthropists. Their recipe for creating ‘good profit’ has enabled them to grow their businesses, reward their employees and still have plenty left over to invest in important charitable groups and institutions supporting America’s freedom. It is a worthwhile read! Chairman and Founder, Charles Schwab & Co. Inc.
Good Profit is an exploration into the mind and philosophy of one of America’s most extraordinary businessmen. Charles Koch explains – through example, anecdote, and impressive analysis – how Market-Based Management has enabled Koch Industries to create real, sustainable value for consumers and businesses alike. He’s as candid about his failures as he is his successes, and willing to expose both in the interest of the greater good. Charles Koch is a genuine patriot, and his lifelong mission is to make America as strong and free as she can be. He believes the principles of economic opportunity that have guided America are worth protecting. This book will teach us how. Charles Koch is right, there is a difference between good profit and bad profit. And this book helps show you the way to good profit – whether you work for an international supermarket chain, a medium-sized regional business, or your own start-up. A must read for any businessperson or serious student of business. As a transformative leader of Koch Industries, Koch the author delivers not just business wisdom but the economic punch of decision-making at the margin and Market-Based Management. The book, like Koch’s management tools, bridges theory and practice masterfully. But the title’s engine says it best: ‘Good profit’ arises from delivering value to customers. And Koch Industries’ spectacular success over the past half century shows that good profit creates great value. Do you consider MBM to be equally applicable in guiding personal decisions? As a soon-to-be new parent, I’ve begun thinking about the principles I want to pass down to my son. Can you share any parental advice, and specifically how you incorporated MBM principles into your personal life? Since kids can spot hypocrisy a mile away, I believe the first rule of parenting is to make your behavior consistent with your words. To me, the primary obligation of parents is to provide their children with the values and understanding that give them the best chance of happiness and fulfillment. This requires that they have a purpose – something to live for. Helping children internalize our Guiding Principles – including integrity, humility, respect and value creation – is a good place to start. I’m convinced parents should also encourage their children to develop a career in something they are not only good at, but passionate about. How is Good Profit different from The Science of Success? That’s a very good question and I’m glad you asked. Although both books cover the same subject (MBM), they are very different. Good Profit is more current and more than twice as long as The Science of Success, so it has much greater depth and detail, as well as more recent examples. There’s also a difference in the audience I had in mind. The Science of Success started as an employee handbook while Good Profit is written for a general audience. 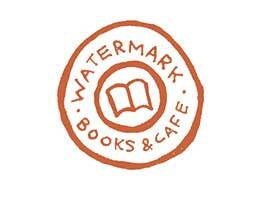 By all accounts, Good Profit is much more readable and it’s also more personal, with a great deal of family history. In addition, it provides much more guidance on how to apply MBM. At the core of Good Profit is the story of a young man who strived to achieve the success that his father had wished for him, through a disciplined approach to business and life. Koch companies embrace the free market in business operations by systematically applying MBM® through several areas of focus. Vision: Focusing on where and how the organization can best apply its capabilities to create the most value for others. Be a leader in innovation, enabling the company to remain a preferred counterparty. Virtue and Talents: Hiring and retaining people based on values before talent, so that everything the organization does reflects the MBM Guiding Principles. Knowledge Processes: Creating, acquiring, sharing and applying relevant knowledge, while measuring and tracking how the organization creates value. Decision Rights: Ensuring the right people are in the right roles with clear responsibilities for which they are held accountable, and having decision-making processes that create value. Incentives: Rewarding people according to the long-term value they create for the organization, in harmony with the Guiding Principles. The Market-Based Management® business philosophy that Charles Koch created and helped apply throughout Koch companies is built on the Guiding Principles. Among the many things that have changed since “Good Profit” was first published are Koch Industries’ Guiding Principles. To learn more about the changes Charles Koch describes as “more necessary, more urgent and more fundamental” than “any that we have made in the past,” visit KOCHind.com/philosophy. 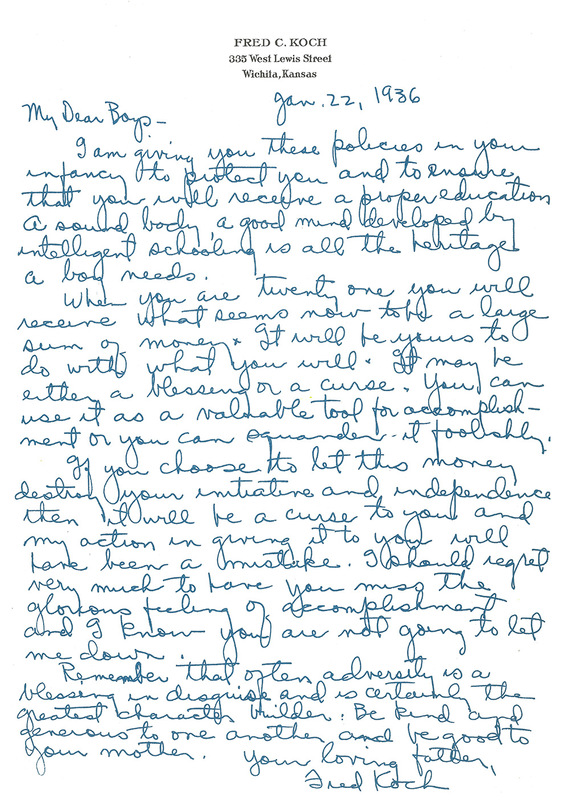 Charles Koch discovered a letter in a safety deposit box after his father’s death. Fred had left the heartfelt message there for his sons decades earlier. Interview With Charles Koch and Warren Cassell Jr.
Charles Koch Discusses “Good Profit” and Politics. Charles Koch’s new book “Good Profit” doesn’t hit bookstores until October, but early reviews from some who have gotten a look at it promise it as a “must-read” for business leaders. 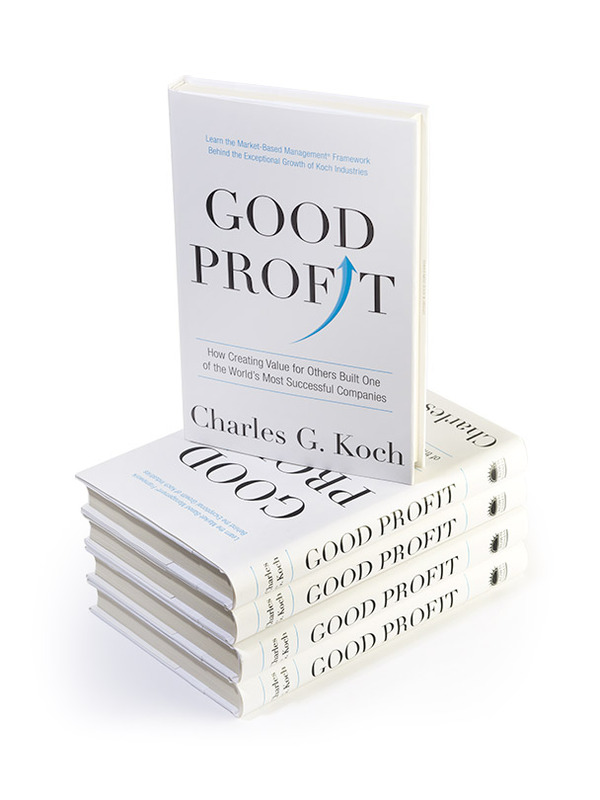 Charles Koch’s new business book “Good Profit” will hit bookshelves in October, but the chairman and CEO of Koch Industries Inc. in Wichita will have a little reading of his own to do over the summer. Eight years after detailing the tenants of Market-Based Management in his book “The Science of Success,” Koch Industries Inc. CEO Charles Koch is again taking pen to paper to share how the business and management philosophy has boosted his business and how it can help boost others. Koch Industries CEO Charles Koch plans to share details of “how creating value for others built one of the world’s most successful companies,” according to a listing on publisher Random House’s website. Billionaire conservative tycoon Charles Koch is writing a new book giving his advice on the business and management style that helped him to create the multinational corporation Koch Industries with his brother David Koch. Billionaire businessman Charles G. Koch is working on a book in which he offers advice on management and entrepreneurship. Click on any of these retailers to order your copy. Wichita, Kansas-based Koch Industries, Inc. began as Wood River Oil & Refining Co. in 1940. Koch Industries’ estimated worth is $100 billion — making it one of the largest private companies in the world. With a presence in more than 60 countries, Koch companies employ more than 100,000 people worldwide, with about 60,000 of those in the United States. From January 2009 to present, Koch companies have earned more than 1,000 awards for safety, environmental excellence, community stewardship, innovation, and customer service. © 2018 Koch Industries, Inc.